Here is a picture of your mouth. Notice all the different parts of the mouth. Imagine all the sounds that are made in every language in the world. People all have the same shaped mouth but they train their mouths to make all the sounds they need to make AND they train their ears to hear those sounds as distinct from other sounds in the language. Let us discover what is happening in your mouth right now. What is happening in your mouth when you make the P sound? Pick the two parts of the mouth that touch when you say P.
Correct. This sound is called a bilabial plosive. Your two lips (bilabial) come together and stop the airflow for a moment so that the air is released in a plosive burst of air. What is happening in your mouth when you make the T sound? Pick the two parts of the mouth that touch when you say T.
Correct. This sound is called a alveolar plosive. Your tongue tip comes up to the alveolar ridge just behind your teeth and stops the airflow for a moment so that the air is released in a plosive burst of air. What is happening in your mouth when you make the K sound? Pick the two parts of the mouth that touch when you say K.
Correct. This sound is called a velar plosive. The back of your tongue comes up to the velar portion of the roof of your mouth and stops the airflow for a moment so that the air is released in a plosive burst of air. In the last lesson we learned about 3 different sounds. Working from there, we are going to look at a few more things that happen in our mouths. For the next questions, study this table. What is the same about the sounds of P & B? How is B different from P? The air goes through the nose. The air is more restricted as it leaves the mouth. The air vibrates in the throat. Which other 4 letters are voiced (cause the throat to vibrate)? Good job! You're figuring this out! What is the same about the sounds of D & N? How is N different from D? Correct - This sound is called a alveolar nasal. 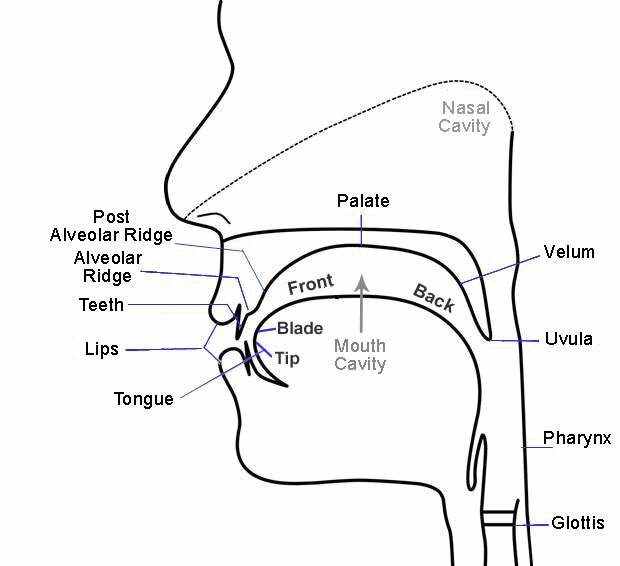 The tip of the tongue touches the alveolar ridge, the voice-box (larynx) vibrates the air, the velum relaxes, allowing air to pass into the nasal cavity, and the vibrating air in the nasal cavity gives the N its particular sound. There is a question mark in the bottom right-hand corner of the table. Based on the pattern you see, which sound does the question mark represent? (Hint - in English we usually represent this sound using two letters.) Which words below contain this sound? Correct - In English we usually use two letters to represent this sound. But many other languages use just one. The phonetic symbol for the voiced velar nasal is ŋ. The International Phonetic Alphabet (IPA) chart below contains many of the consonantal sounds that are used in languages around the world (note that this is a simplified version). See how the chart matches the articulators found in the mouth. In each column of the chart, the items on the right are voiced (throat vibrates). Listen to the following sounds from the Alveolar column of the chart. You will hear the sound in three different environments: before a neutral vowel sound, between two vowels, and following a vowel. Try to say the sounds directly after the person. While you are doing this, pay attention to what your tongue and other articulators are doing. Please do this exercise twice before moving to the next step. means: ‘to dig up’ in Suki, a language of Papua New Guinea. means: ‘toes’ in Mangbetu, a language of the DRC. means: ‘he lives there’ in Oaxaca Chontal, a language of Mexico. means: ‘it is sweet’ in Tlingit, a language of BC and Alaska. means: ‘he makes it itch’ in Highland Mazatec, a language of Mexico. means: ‘brush’ in Zulu, a language of South Africa. 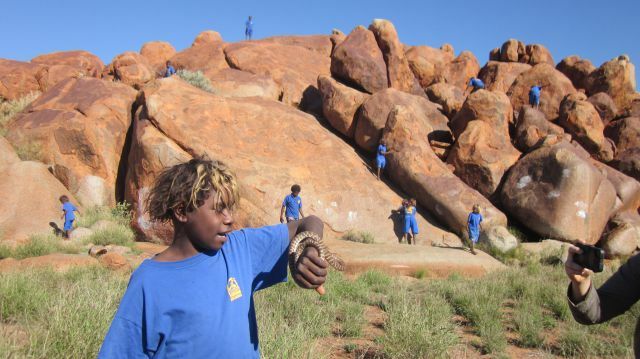 Let’s visit the Ngaanyatjarra people from the Western Desert of Australia. They represent over 1,200 speakers and since 1991 have had the full New Testament. How do the Ngaanyatjarra spell “Andrew”? Each language is unique and, because of this, requires its own tailor-made orthography (alphabet and writing rules). Part of communicating God’s message to people from different cultures and languages is making sure that it conforms to these orthographic rules. Because of this, names in the Bible often sound quite different through a process called transliteration. _____ Start with the English spelling. _____ 'ew' is represented by 'u'. _____ They do not use 'd'. Closest sound is 't'. _____ Every word begins with a consonant, which would be 'y' in this case. _____ You cannot have 3 consonants together, so put in the vowel 'i' to break it up. _____ All names end in ‘nya’. he saw two brothers, Simon called Piitanya (Peter) and his brother _____ (Andrew). If you enjoyed learning about the science of sound systems from different languages, perhaps you should consider getting training to be a language survey worker. They travel around to different areas within a country with a standardized set of words. 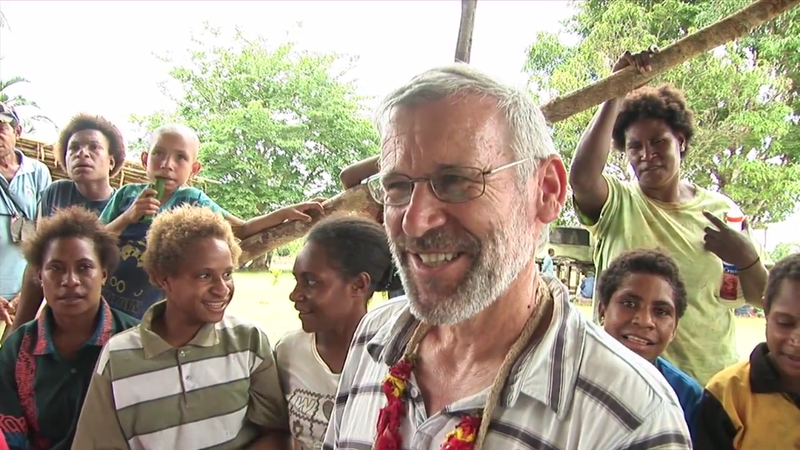 Survey workers ask people to give the equivalent of each word in their language and then transcribe that word exactly how it is pronounced. Then by comparing the list of words gathered in many different areas, the survey worker is able to identify language boundaries and discover how closely related languages from two areas are. After the video, please click here to go to the Home page and try another set of challenges.